Today the Church celebrates summit of our salvation. 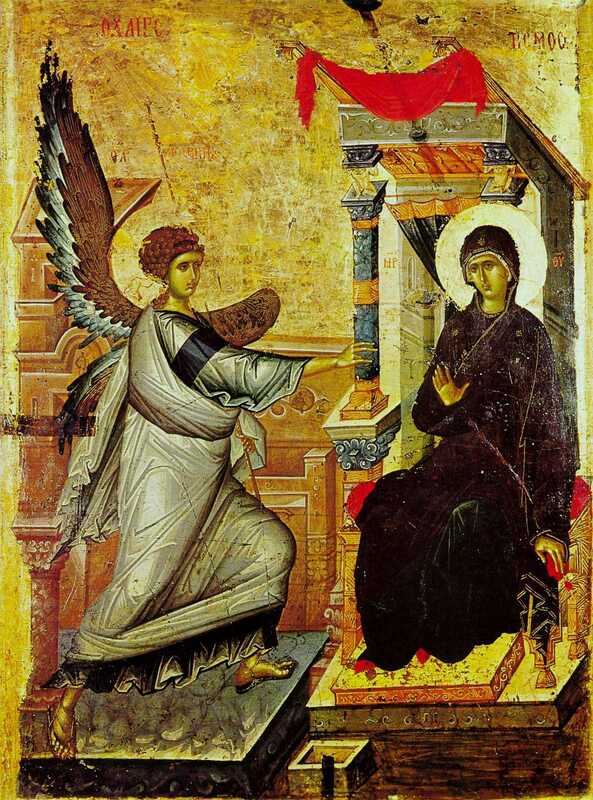 The Annunciation of Gabriel to Mary that she would be the Theotokos almost always falls during the Great Fast. (*) According to the liturgical norms, it is celebrated on whatever day it falls, and the Divine Liturgy is celebrated, even on Good Friday. (**) The meaning of the Annunciation, however, is in conformity with the meaning of the Great Fast. The Great Fast is a journey from the sin of Adam and Eve to the Resurrection of our Lord. It is a passage from human pride to fidelity to God’s plan of salvation. The sin of Eve, which became the fundamental sin of the whole human race was to choose one’s own plan for salvation over God’s. It’s result, though, was death. Jesus in the resurrection, takes the power of death and twists it into life, as St. Paul said, “We were indeed buried with him through baptism into death, so that, just as Christ was raised from the dead by the glory of the Father, we too might live in newness of life” (Romans 6:4).